Tachiagaaru (or Tachiagirl depending on how you decide to romanise the Japanese title) is the first S/mileage single to feature the new submembers, the first not to feature Ogawa Saki and the last single to feature submember Kosuga Fuyuka who withdrew from the group after 26 days due to health reasons. How does this “new S/mileage” sound? Pretty much the same as the old one, with perhaps a bit of a fuller sound. I love the outfits but the cover is a bit basic for my taste. Tachiagaaru is a fun song. The instrumental is very catchy yet it really needs the vocals to make the song come alive (unlike say °C-ute’s Kiss Me Aishiteru where I often found myself only listening to the instrumental version). The submembers have low vocal involvement (not surprising since some might not end up making it as full members) so it’s up to the three remaining “S/mileage OG’s” to put in most of the work. This really made me realise how much they’ve improved in such a short time. They all have vastly increased stamina and stability in their voices. They’ve really come a long way. The music video is a greenscreen affair and the greenscreen work is quite intricate with lot’s of nice little touches in the background. I particularly enjoyed the interludes where the members are just dancing around brandishing their glowsticks (like many an idol fan has the habit of doing.). Adding one additional kind of shot might have added some needed variety to the music video but on the whole it’s decent enough. I also picked up the Limited E. At just 500yen, how could I not? Of course this being S/mileage we have a nice selection of different coupling songs to choose from. Smile Ondon is song that will probably remind old school H!P fans of Odoru 11’s Shiawase Kyouryuu Ondo. It’s interesting to hear S/mileage’s take on this kind of song. It’s not something they typically sing and the way they modify their voices (especially Fukuda Kanon, who also contributed to the chorus of this coupling song) is really fun to hear. There’s of course the ever present cover song. 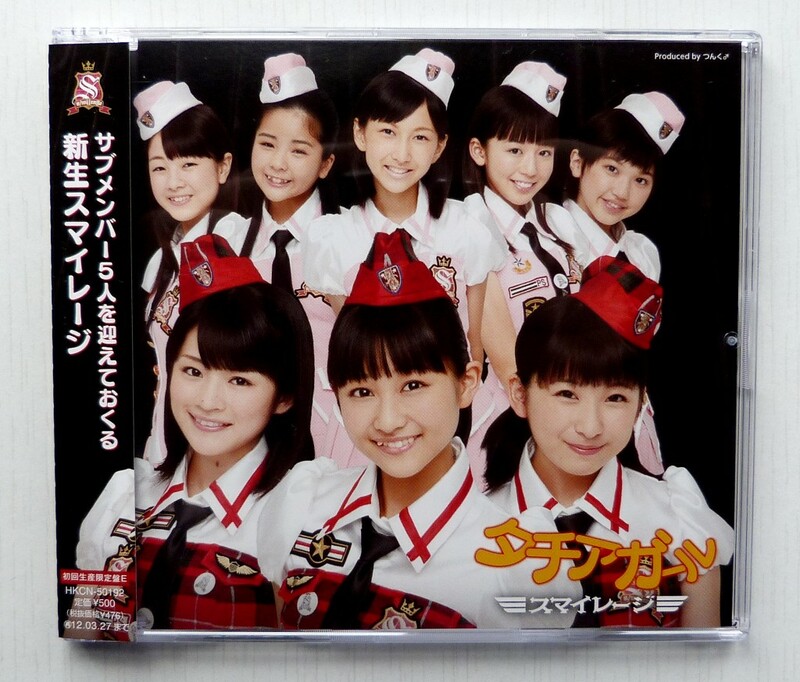 This time it’s Boogie Train ’11, an updated version of Fujimoto Miki’s Boogie Train ’03. I’ve seen people criticise S/mileage for always including cover songs with their releases, but I myself quite like them. The instrumental is usually nicely modified and it’s always nice to hear a fresh take on classic H!P songs. I’ve always seen them as tributes from S/mileage to their various H!P senpai’s. Once again it’s Fukuda Kanon who shines here but then Fujimoto Miki’s discography is no stranger to her as she performed a stunning intro to Romantic Ukare Mode during the S/mile Factory Tour. Lastly we have the S/mileage Singles Gekijou Moe Remix, a wonderful melange of all of S/mileage’s most popular songs underpinned by a thumping dance beat. It’s a really fun listen that easily transitions from quirky to nostalgic to just pure awesome. Once again I’m quite happy with a S/mileage release. Much like Morning Musume (and unlike say Berryz Kobo, °C-ute, Buono! or Mano Erina) I have yet to dislike one of their releases. The original members are still a lot of fun to follow and the new submembers are bringing their own unique energy into the mix. It will be difficult to see any of them part with the group if they don’t make it as full members. As usual this single is available on CDJapan (free poster included as external bonus) and iTunes. If you like this single, then buy it. Artists should be paid for their efforts.